The BodyRip trustworthy design lets you exercise virtually every major muscle group in your body. Sturdy construction of the extra wide and tall mainframe provides you with easy access to an endless array of high and low pulley exercises. Your workout options become unlimited when you invest in one of the most versatile and functional machines manufactured today. The BodyRip Cable Crossover Machine will exercise virtually every muscle group in your body. 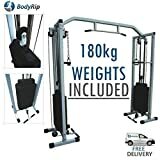 The extra wide and tall main frame provides you with easy access to an endless array of high and low pulley exercises. Your workout options become unlimited when you invest in one of the most versatile and functional machines manufactured today. User assembly is included but we can also send you it via email.